If your job involves working with a lot of documents and document copies, you might frequently end up wondering where the file you’re currently editing is saved. Sure, you can always goto Save-As to find the path files are being saved to however, that takes time I don’t normally have. Time to fix that with this very groovyPost! So today I’m going to show you a really quick and useful groovyTip for all Office 2010 programs that will allow you to view the location of a file at the top of the Quick Launch Bar. Pick any Office 2010 product installed on your machine and open it up. To access the program’s settings, you need to go to File > Options. 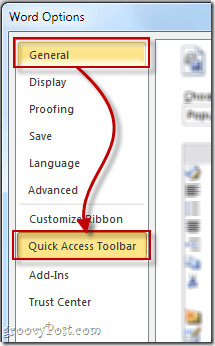 After opening Word Options find your way to the Quick Access Toolbar tab. Now it’s time to do what we came here for. For more ease, from the drop-down list on the left, Select Commands not in the ribbon to narrow down your search a little bit better. Now scroll down somewhere around the middle of the letter “D” until you find Document Location. Then single click to mark the feature then click the Add button to add the feature to add it to the Quick Launch Bar on the right..
Once in the Quick Launch Bar List (right side) you can mark it again and use the two arrows to move it up or down. Personally, I’ll keep mine at the end. Once done, Click OK and you’ll be all done! 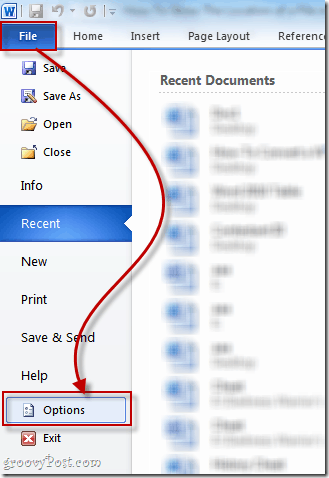 Do you have a groovy Office 2010 tip? Please share in the comments below! Thanks…Nifty idea! I now have a better understand of the Quick Launch toolbar in Word 10. Keep up the good work. For MS Access, “Document Location” does not appear as a command option. I used to do this via View –> Toolbars –> Web, but that is no longer an option. Any suggestions? Thank you for this helpful hint. How do you implement this in Visio 2010?!?!? I think the process is pretty much the same. Just press the upper left button in Visio and look for the Options menu from there. If there’s something different about it I’ll make sure to post a tutorial on how to enable this feature in Visio and other Office products. I’m afraid my Visio does not have command “Document Location” available – so any thoughts for a workaround? Is there any news on the Document location in other Office programs? Too True…. Will start working on that one! Very good and helpful post. Thank you. Thanks so much – don’t know why Microsoft Support could not answer this question. Their solution involved writing and installing a complicated macro! Thanks Stefan. I always forget how to set this up when I’m “upgraded” at work! I have Windows 10, and when I go to “Commands not in Ribbon” there is no option (or icon) to show “document location”. I am still unable to add the path & filename to a document outside of header or footer. Any other help you can give?